The Plank Center, and sponsors Heyman Associates and IBM, conducted the largest study of leadership in public relations. The Global Leadership Study (2012-13) included two phases: an online survey completed by 4,500 professionals in 23 countries, and depth interviews with 137 top leaders in 10 countries/regions. The study explores key issues in the profession, how PR leaders manage them and how we can improve the preparation of communication leaders for an uncertain and complex future. 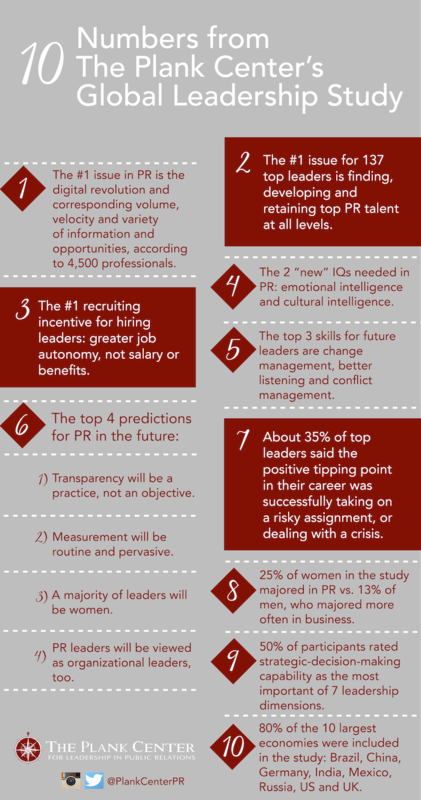 Below is 10 numbers you need to know from the Global Leadership Study.